The annual meeting of the International Whaling Commission (IWC) has ended with member governments agreeing to try and resolve their differences.- The next year will see intensive dialogue between pro- and anti-whaling countries, and could lead to a package deal next year. But there is still significant water between the camps on key issues. The meeting also decided to embark on a research programme into theimpact of climate change on whales. The only vote of the meeting saw Greenland's bid to add humpback whales to the annual hunt by its indigenous Inuit communities defeated. IWC chairman William Hogarth, the US commissioner, was cautiously optimistic that the peace talks might bear fruit. "I was basically very happy with the meeting, although I don't think it's going to be easy, there are definitely some big issues such as the lethal take of whales and scientific research whaling," he told BBC News. "The number of whales being killed is increasing; and I think the way we ought to be looking at this, from the point of view of countries that are anti-whaling, is how can we reduce that number?" All members of the commission, ranging from the strongest whaling nations including Japan to the most vociferous opponents such as the UK and Australia, have endorsed the idea of seeking compromise, although some were pessimistic about its prospects when talking on the meeting's fringes. 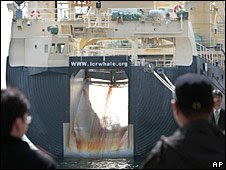 The most fundamental demand of anti-whaling nations would be that Japan halts its scientific whaling programme in the Antarctic, and perhaps agrees to close the provision for scientific hunting completely. "I don't think we can give (it) up, and we have a very basic position that we have to guard," said Japan's alternate (deputy) IWC commissioner Joji Morishita. "But I keep saying that we can still talk to each other; we have differences of opinion, differences of position, but that does not mean we cannot talk to each other." For their part, Japan and the other active hunting nations - Norway and Iceland - would probably have as their most fundamental demand that the global moratorium on commercial whaling is at least partially lifted to allow hunting in coastal waters. Environmental and animal welfare groups are divided on the merits of the peace plan. Some agree with Dr Hogarth's view that it might lead to a fall in the number of whales killed, while others say there should be no compromise, and are angry with anti-whaling governments including the US for pursuing the initiative. "It's not just the interests of the American people that are being abandoned, but also the future of the world's whales," said DJ Schubert of the Animal Welfare Institute. But Wendy Elliott of WWF's global species programme said a dialogue was worthwhile. "We cannot continue in the scenario that we have at the moment; we need to see a resolution to this impasse," she said. Conservation groups were also pleased with the decision to set up an initiative on climate change and cetaceans. Changes to sea ice in the polar regions has the potential to impact some species severely. Several groups also presented studies concluding that the argument that whales need to be hunted in order to increase the availability of fish for human consumption - which circulates among some of the pro-whaling bloc - is simply wrong. "We've shown that even in those areas where whales do eat commercial fish species, the whales are a minor factor in rises and falls of fish stocks, and the dynamics of those systems can be much better explained by looking at interactions between fish species themselves," said Ms Elliott. Officials from IWC member governments will now embark on a series of discussions leading to the next full meeting in Portugal in a year's time.